Mefford Associates provides business training, coaching and boutique advisory services in GRC. Mefford Associates provides business training, coaching and boutique advisory services in the areas of ethics, governance, risk management, compliance (GRC) and internal audit; including the GRC Professional, and Audit training that prepare individuals for OCEG based GRC certifications. We provide practical resources and tools to help you implement the concepts discussed in our training and coaching sessions. Mefford Associates is also an OCEG Approved Training Partner. Our founder and President, Jason Mefford, is seen as one of the most influential, engaging and respected experts in the world on governance, risk management, compliance (GRC) and internal audit. He has trained or consulted with hundreds of companies all over the world. 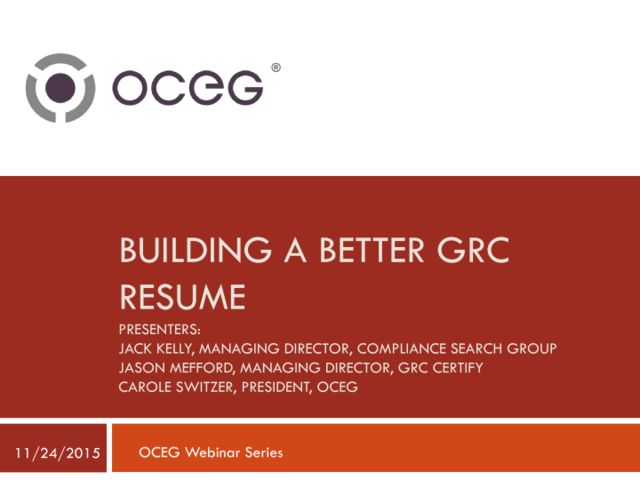 Jason has been actively involved with OCEG since 2007 as an OCEG Fellow, is currently the Managing Director of GRC Certify, and is a contributing author of the OCEG GRC Capability Model (Red Book) version 3.0.